This Count and Capture board was donated to the Museum in 1975. It was brought from Uganda to the Museum by a professor returning from a field trip to Africa. She said it was an Omweso board. The board in the Museum's Collection is 51cm long x 28.5cm wide x 2cm thick. It is made of an unfinished and unknown type of wood. At one end of the board there is a handle with a drilled hole for hanging the board on a wall. The board has 32 square depressions (5.5cm each) in four rows of eight. Different from the other Count and Capture boards in the Museum collection, the Omweso board is a four row Count and Capture board. Murray indicates that the game is a variation of the two row Count and Capture games, and it can be found primarily in West Africa. His book illustrates and describes boards (with various names) that are 4x8, 4x10, 4x12 through 4x28. The graphic at the right (from Murray, page 211) illustrates that a four row board can be of different lengths. 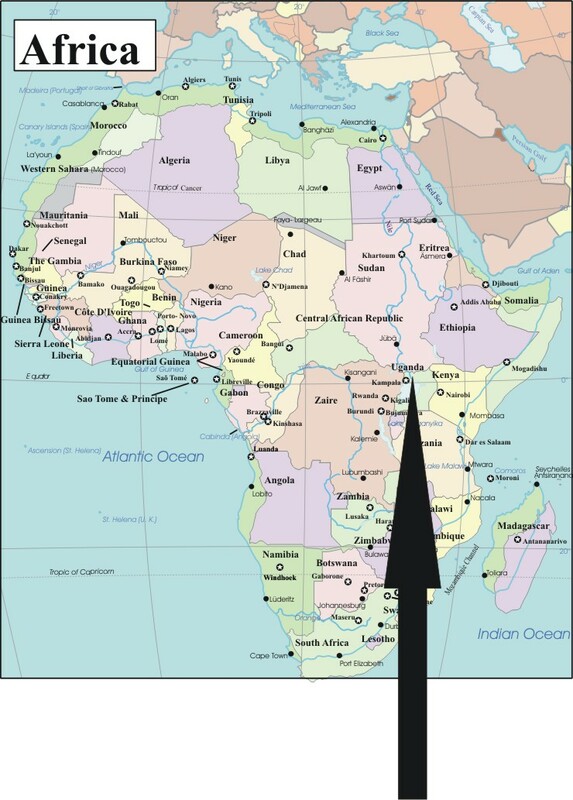 Nsimbi and Russ list a range of names for four row games, dependent upon the many different languages spoken in Uganda and other areas in that part of Africa. M.B. Nsimbi, Omweso, A Game People Play in Uganda, Occasional Paper No. 6, African Studies Center, University of California, Los Angeles 90024, 1968, 40 pages. H.J.R. Murray, A History of Board Games Other Than Chess, Oxford: Clarendon Press, 1952, Pages 206-224. Brian Wernham, International Omweso Society, has provided the following instructions to the Museum. 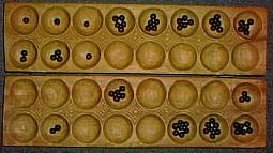 Omweso is a type of Count and Capture game for two players and played on a board with 32 holes arranged in 4 rows of 8 holes each. 64 seeds are used, and are kept in play throughout each game in the set. The 2 players divide the seeds (or 'empiki' pronounced: "em-pee-chee") into the holes as shown to check the correct number of seeds are present before the games starts. Having checked that the correct number of seeds is present, the board may be setup in many different combinations, depending on the choice of the players. A notation will act as a shorthand for describing the initial placement of seeds, and the subsequent play. I will refer to the player controlling ‘A’ to ‘P’ as "Upper" and the player controlling ‘a’ to ‘p’ as "Lower". The players divide the seeds into the holes in the rows nearest themselves to check the correct number of seeds are present before the games starts (i.e. 32 seeds each). The notation for this initial checking position is "4i-p; 4I-P" indicating 4 seeds in holes i to p, and 4 in holes I-P.
9a,3b,4d-f,h,m; 4A-F,3G,5P (i.e. Lower has placed 9 seeds in a, 3 in b and 4 in all the holes from d through to f, 4 in h and the other 4 in m. Upper has placed 4 each in A through to F, 3 in G and the remaining 5 in P). Lower starts the game and scoops up the 4 seeds in d, and sows them anti-clockwise, one into each hole as follows: c, b, a and the last into i. That is the end of Lower’s turn since the last seed fell into an empty hole (i). Lower can choose to reverse capture by playing the 3 seeds from i clockwise round to c to capture the 2 seeds in FN. He can then play these 2 captured seeds by normal (anti-clockwise) play into jk and end his turn, or he can decide to reverse capture again by playing the 2 captured seeds into a and b, capturing the 4 seeds in G and O. We can note this reverse in the following notation i(3)xF - the 3 seeds in i reverse capture F and N.
QUIZ - 5d, 2j; 1F, 3G, 2H, 1NOP with the other 48 seeds elsewhere. Question: How can Lower capture all the seeds from F-H and N-P? Answer: d5, j(3)xG, j(4)xF, j(2)xH. This is a Relay Reverse Capture. Here is the position at the end of Lower's turn, and an explanation in plain English: The 5 seeds in g are sown anti-clockwise, and land in j making 3 which reverse capture G and O. These 4 seeds are played from j into i, a, b and c, and reverse capture F and N. These 2 seeds are played from j into i and a, reverse capturing H and P. The 3 seeds are then played normally from j anti-clockwise into k, l, and m.
Initially there were no seeds in a, b or c to assist in the capture. The move d with 5 seeds sets up one seed in each of c, b, a, and i, and then makes the 2 in j into a 3 to reverse capture G, ending in a cascade of capturing. j is empty at the end of Lower’s turn. Our notation assumes normal anti-clockwise sowing and capturing without needing it to be noted (so the final sowing of the captured seeds from H and P into k, l and m is assumed). This makes the notation briefer, and makes it easier to keep up with fast players. Normal - the loser cannot move since he is left only with singleton seeds (i.e. no hole with more than one seed). Akakyala - the winner has captured seeds from the loser in two separate moves before the loser has even made his first capture of the game. Emitwe-Ebiri - Double headed knockout or 'cutting off at the head'. A capture is made of opponent's holes a&i and h&p (the 'heads' of the board) in the same move. Akawumbi - 'The Billion' the opponent's seeds are initially in every hole in the board (exceptionally rare, but this could happen in a real game - see if you can work out how! ), and they are all captured in one move with the last holes captured being of a 'head' (i.e. a&i or h&p). International Omweso Society & Brian Wernham 1999. All rights reserved.